When Donald Trump announced in June that the US would pull out of the Paris Climate Agreement, it was noticeable that the most effective opposition came not from Congress but from cities and states. 379 mayors representing more than 68 million Americans said they would implement the Accord regardless of the head-in-the-sand attitude of the country’s president. More significantly, given the weakness of the Paris agreement, more than 40 cities have gone further and committed to 100% renewable energy no later than 2050. This practical defiance highlights how the city in our globalised world is emerging as a place of resistance, alternatives and solutions to our world’s multiple crises. Cities have a long history as cradles of social transformation, whether it was the urban revolts in Budapest, Stockholm and other European cities in 1848, the municipal victories and participatory budgeting experiments of the Workers Party in Brazil in the late 1980s or the emerging municipalist movement in Spain and other regions more recently. Cities constitute a privileged place to organise collectively and to imagine new ways of living and working together, spaces where bodies and minds interact and where ideas spread quickly and have unparalleled impact. This is not to over-romanticise them. Cities, as other human constructions, have their own structures of concentrated power, inequality and exclusion. Greek city-states framed ideas of democracy that we still use today, but their societies were based on slavery and patriarchy. Medieval city-states were laboratories of modern liberal democracies and welfare systems based on taxation, but they were also the places where capitalism, colonialism, international finance and unfair trade relations emerged. Cities have a long history of providing privileges to their inhabitants, while extracting wealth from those outside its boundaries. Cities have a long history of providing privileges to their inhabitants, while extracting wealth from those outside its boundaries. Nevertheless, cities have noticeably emerged as a critical arena for many recent social struggles from the Arab Spring in Tahrir square, Cairo or the Umbrella Revolution in Hong Kong. It has happened at time when cities for the first time in history now house more than 54% of the world’s population (expected to reach 67% by 2050). For social movements, the cities are a strategic place to organise, not only practically but also politically. More than two decades of neoliberalism have succeeded in entrenching corporate power within national and international institutions and international legal frameworks – making it ever more difficult terrain for people’s movements, who have to defeat powerful interests and appeal to a deliberately disempowered electorate. Cities by contrast offer a more level playing field where people power can still take on and defeat corporate power and thereby prove that political mobilisation can deliver results. The political theorist, the late Benjamin Barber, argued that cities are capable of reconnecting “participation, which is local, with power, which is central”. While nation states used to play that role, he argued they have become too large (and we would add also too captured by corporate capital) to sustain the kind of “bottom-up citizenship, civil society and voluntary community” that is essential to democracy. Across the world, social movements are actively seizing this potential power, advancing important social demands, whether for dignified work, sustainable food systems, green energy or racial justice. Much of this transformation takes place under the radar, as mainstream largely corporate media continues to focus all its attention on the happenings in the national corridors of power. Even we were surprised in 2015 when our organisation, the Transnational Institute, decided to look at the number of municipalities who had brought water services back under public control and discovered 235 cases in 37 countries of cities and communities remunicipalising their water. Given the power of transnational water companies like Suez and Veolia – and the grip that the ideology of privatisation has on national and international water policy – this was nothing short of a silent revolution. 235 cases in 37 countries of cities and communities remunicipalising their water… – nothing short of a silent revolution. The experiences of trying to set up green businesses in Totnes in the UK, for example, eventually led to an international project, Reconomy, that seeks to build local economies that are sustainable, equitable and anchored in wellbeing, rather than tied to economic growth at any cost. An initiative by the New Delhi government to set up hundreds of small free health clinics to do diagnostics and simple treatments has inspired health activists across the world. In Barcelona, the experience of resisting house repossession inspired some activists to fight and win municipal elections based on a participatory platform of policies that include fining banks that speculate on empty homes, creating a new municipal energy company and providing sanctuary to refugees. 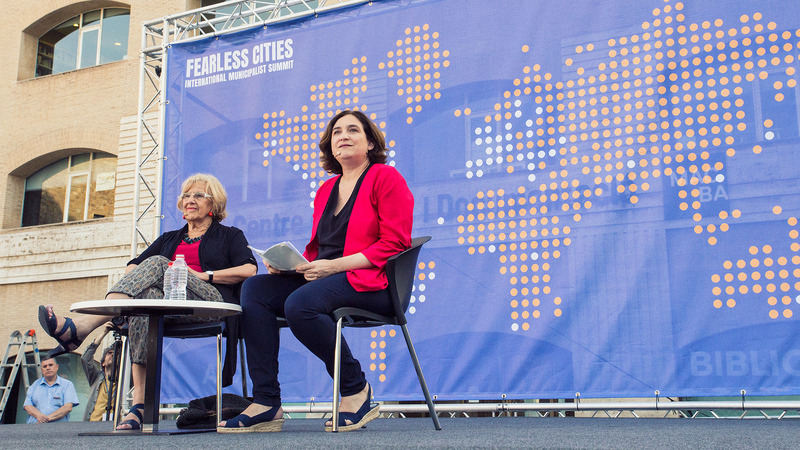 Barcelona’s new city council is now helping to foster a movement of ‘fearless cities’ committed to the same principles of participation, openness and social and environmental justice. Their first gathering in Barcelona in June 2017 attracted more than 600 participants representing more than 100 municipalist platforms from around the world. Municipal activism is also an opportunity to put feminism and the feminization of politics at the forefront. As Laura Roth and Kate Shea Baird have argued “the feminization of politics, beyond its concern for increasing presence of women in decision-making spaces and implementing public policies to promote gender equality, is about changing the way politics is done.” In practice, this means leaving aside patterns of our patriarchal society such as competition, dominant leaderships, vertical organizations, egoism and structures that have typically excluded women from politics. It is noticeable how many of the new leaders in the municipalist movement are women. Perhaps the proximity, scope and nature of the political conflicts at the city level, such as struggles for access to water and housing, rather than monetary policy or military alliances, also provide an arena where non-patriarchal modes of political action are better suited. These successful experiences around the remunicipalisation of public services and the rising municipalist movement have inspired TNI to launch the Transformative Cities Initiative. Our goal is to build an atlas of real utopias, make these experiences viral, and to share the learning that comes from implementing these experiments. This month, we are launching a unique participatory award to recognise transformative experiences. In the first year, the focus will be on water, energy and housing. In future years, the initiative will expand its focus to other areas such as migration and solidarity, territorial food governance and drugs harm reduction. We are encouraging both social movements and cities to use this opportunity to share your story. We plan to bring participants together, to learn from and systematise these experiences, in order to inspire and accelerate the process of transformation in other regions and places. We are giving special attention to experiences from the Global South, whose experiences are not adequately focused on or shared in global debates. We are giving special attention to experiences from the Global South, whose experiences are not adequately focused on or shared in global debates. 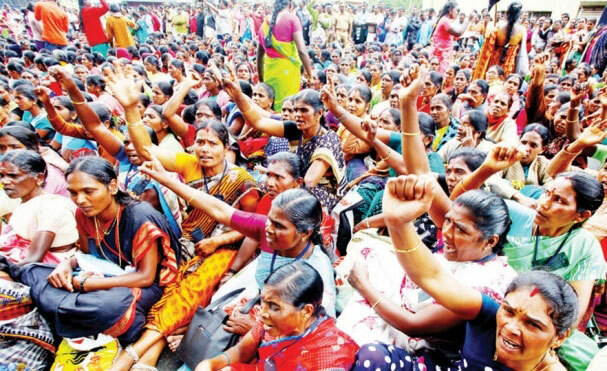 At a time when our current political framework offers most people a choice between neoliberal globalisation and authoritarian nationalism, between the global mall and the border wall, it is critical that the real alternatives coming from social movements are fertilized and strengthened. A strategy that only seeks to resist increasingly authoritarian national governments, defending an ever-shrinking civic space, is demoralising and self-defeating. Similarly a strategy that articulates national and international alternatives that have no chance of realisation is equally disempowering.